Windows 10 PCs communicate with Microsoft servers regularly even after making all available privacy related changes. 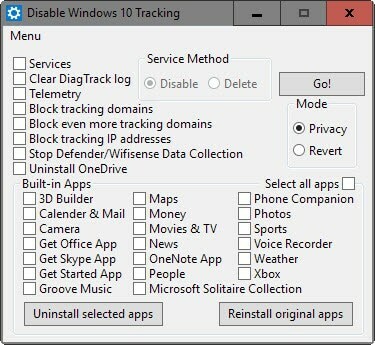 The developer of DisableWinTracking is no longer working on it – see https://goo.gl/g4tp1D. For completeness’ sake that should be mentioned in your text too, Martin. Thanks Martin for the ongoing security analysis of Windows 10. I’m worried recent updates to Windows 7 might have also introduced “telemetry” data collection and other eavesdropping features. Please keep us posted. Don’t worry about it, be sure about it! Do a google search, and you’ll find which KB’s you should avoid. And for privacy’s shake, turn off automatic updating. So to avoid invasions of my privacy by MS I have to have my privacy invaded by Google. That makes so much sense I wanna puke. Wow, that is really quite a lot. I’d like to use the HostsWindowsBlocker but I also want automatic updates. I wish there was a tool that automatically allowed only the connections needed for updates and only for scheduled time every day. Which is why you need to block them at the router. Microsoft (and other companies) can bypass the HOSTS file and other software firewalls, but they cannot bypass the router (at least not nearly as easily). Very good point, Bob. The router is really the only surefire way to control your internet connections. Unfortunately it is also beyond the technical abilities of most users. I can just imagine my parents editing their router settings…. Nightmare. This is why the only real option is to just not use Windows 10 at all. If you cannot trust your operating system and constantly have to fight with it, what’s the point of owning a computer? I can do without that stress. It’s good to see someone taking the time to do a proper analysis of the connection Windows 10 makes even though it seems rather incomplete and possibility open to criticism from pro-Microsoft people it’s better than previous attempts, it would be interesting to know how quiet Windows 10 is when its fully hardened via group policy and such. To think that these sorts of test have to be done on Windows saddens me and i fear most people lack a proper understanding of what the possible implications are of having a desktop operating system with such data gathering potential, i shudder to think of the day when Governments, Doctors, Hospitals, Banks, and other organisations start rolling out Windows 10, how many of those organisations are going to properly harden their systems against Microsoft’s data gathering? And now that CISA was passed in December, companies have zero liability when handling your personal data. Something that irks me and I never see it mentioned, is the increased wear and tear, additional electrical consumption involved in running data collection tasks on the end user’s PC. We’re essentially paying for this on our electric bill, replacing fans and hard drives, etc. The logging appears to be IPv4 traffic only… any news on IPv6 traffic? It seems Microsoft have a server doing NAT too and from IPv6 to IPv4 and vice versa, what i found most disturbing is that VirusTotal has a report listed for that IP address and it seems to be routing BitTorrent traffic, does BitTorrent default to using IPv6? There are some IPv6 trackers out there although all of the clients in *nix appear to be IPv4 based… but I think I’ve seen a couple of IPv6 peer connections but very rarely. I am rarely on Windows but I know some versions have IPv6 typically enabled by default… so if everything through an intranet is IPv6 ready then that may be missed in the logging report. As you pointed out can NAT, can “upmix”, and it can also “downmix”… so I believe both should be captured in privacy and security logs from enabled platforms. I’m guessing the person who carried out these tests was on a IPv4 network, when Windows attempted to route IPv6 traffic (IPv6 is built into Windows and automatically enabled) but couldn’t it automatically routed the traffic to Microsoft’s Teredo tunneling server and performed a translation. The question is what part of Windows 10 is using IPv6? Windows Update on Windows 10 is, by default, a torrent setup. However BitTorrent, by default, doesn’t care if it’s IPv4 or IPv6. It uses whatever connection is setup. The 94.245.121.253 address relates to a server in Ireland, at one point it was related to the Microsoft Customer Experience Program (which is on by default. Search for CEIP on your computer you’ll fine that option; this is for Vista and Up). However, it might not actually be doing an IPv6 call-out, but rather IPv6 or IPv4, which goes to a server that routes either connection to the proper server info. I saw the VirusTotal page concerning that particular IP address. It also seems that it’s a revolving address, meaning Microsoft changes what server is pointing to periodically. One of the more recent ones, relating to a company called MarkMonitor. They do a plethora of services, one that caught my eye was Domain Management. Hard to tell exactly what the server is being used for. From the amount of call-outs it listed as doing, it’s more than likely something to do with the Microsoft Store app. @Decent60, Sorry maybe i confused the subject by mentioning BitTorrent, VirusTotal has the IP address in question listed not as BitTorrent traffic but as the executable, have a look for yourself. The section that was of interest to me was the hashes for the “detected files that communicate with this IP address” section, if you follow the links for each hash you can see all the files listed that communicated with that IP are BitTorrent clients. I maybe wrong but that seems to indicate to me that peoples BitTorrent clients are broadcasting IPv6 traffic and as their not on an IPv6 network the Teredo tunneling protocol is packaging the IPv6 packet into a IPv4 packet, sending it to Microsoft’s Teredo tunneling server, and then that server either unpack the IPv6 packet and sends it on a IPv6 network, or it performs a NAT from IPv6 to IPv4. Microsoft have in the past stated that this is, as you say, their Customer Experience Program (aka:telemetry) but the thing that raises questions is that the port number 3544 is what Teredo servers listen on, and that other IP tools report that’s what it’s being used for. Either way it defiantly needs more investigating. When I click on the ones that were detected, it comes back with Malware or Trojans. Probably zombie computers trying to infect other computers by going through open connections, possibly using the uTorrent client as a means to do or those people downloaded an infected uTorrent client (thus why it was registered as uTorrent client). The problem is, we don’t which direction the information was communicated. Whether it was pre-programmed to go there, whether it was set to search out open connections and to follow/hijack or coming from that IP address. Would be a bit helpful if they stated how the communication was started. As for the IPv6, that situation is possible, as you described it. Further investigation is needed and it would be nice if they captured the packets and recompiled them to find out what information was actually being sent (if possible as it might be encrypted). The only reason VirusTotal lists BitTorrent clients, both as infected and clean clients, as having sent traffic to that IP address is, as far as i can tell, because they were using IPv6 on a IPv4 network so, by the look of things, Microsoft’s Teredo tunneling protocol attempts to send that encapsulated IPv6 packet to a Teredo tunneling server that can either route the IPv6 packet onto a IPv6 network or translate the IPv6 packet into a IPv4 packet and presumably send it on its way. That the IP address lists BitTorrent client as having sent packets to it is unrelated, the only reason (afaik) that it lists them is because BitTorrent clients and Windows are setup to use IPv6 by default, any other application could have been use to send the IPv6 packets it just so happens that VirusTotal list BitTorrent clients. It seems if you’re not connected to an IPv6 network that Microsoft have setup a Teredo tunneling server to do IPv6 to IPv4 translation, much like how a NAT router works, the only reason i mentioned BitTorrent clients was because (afaik) they have IPv6 enabled by default. It is impossible to stop Windows 10 to gather data and phone home. All these so called privacy tools for Windows 10 are not just useless- they are dangerous placebos which lull the users into a false sense of security. With Windows 10 privacy and security are simply impossible because it was created with the intent to collect private data and to spy on users, that’s why Mictosoft is so desperate to find more and more ways to deceive users to “upgrade” to Windows 10 “for free”. Why a take-it-all or forget-it-all attitude? I believe cyber reality is somewhat comparable to that of life, of our lives: a blend, a mixture between the best and the worst. Perhaps this applies as well as to what we can achieve, in our defense against Web as well as System intruders : we can limit the intrusion, it’ll never be totally effective but we can achieve already quite a lot. When very large amounts, arrays of data are processed we can imagine rules of prioritization filtering the less uncovered data from the most, and we can help get our data more complicated to being cross-reference assembled. Of course there’s a price to pay, in this that privacy is not a symmetrical option to no-privacy, it requires effort to conciliate the best you can obtain with awareness as to not strive so high that you’d loose the baby with the bath water. Freedom is, always has been and always will be a continuous effort of balance, of equilibrium and as such incompatible with a radical approach of concepts leading our lives. So, let’s make it tougher even if we cannot be as tough as the toughest :) Never surrender, man, never. ‘And just don’t use Windows 10 – the telemetry is easily shut off in Windows 7 and 8.x so they make more than suitable alternatives. That’s quite a jump. Just because Microsoft is collecting data (telemetry and opt-in enhancements such as Cortana who keeps preference data), it doesn’t mean any “private” data is being collected. Microsoft has explained several times what is being collected, which is similar to what Apple does as well. It’s all in their privacy notices, EULA, etc. Including both opt-in services, such as cloud-based email, voice assistant, etc., and the telemetry (anonymous aggregated data), it’s almost the same story between Windows 10 and OSX. A careful reading of the legal disclaimers actually shows the potential for more types of data (a little more than telemetry) possible under OSX. It’s ironic how many times this has to be discussed with Microsoft, but not with Apple. It’s also ironic how people get so fired up about this, when real privacy issues exist through online advertising infrastructures built into nearly all websites. Even with a bunch of add blockers, your computer gives out much more information about you (personal info that you supply by browsing and buying, not telemetry) and aggregates it across all of the sites and services you visit. Want to buy a list of people (and email addresses) with Type-2 Diabetes? It’s readily available, and there are many companies that will sell it. Microsoft does no such thing. @Loss of Freedom, You say “it doesn’t mean any “private” data is being collected” but it also doesn’t mean it’s not, yes Microsoft have explained what’s being collected but if you knew anything about Microsoft’s history you’d know their not above breaking the law, let alone their word. And yes Apple has a similar attitude to privacy and data collection but then again OSX isn’t used on 90% of desktop PC’s, whatever the reasons are for OSX having such a small market share in the desktop space it seems to me Microsoft are intent on copying Apple’s business model, if it hasn’t worked for Apple who’ve had a lot longer to get things right what makes you think this new, for Microsoft, direction is going to work? All of *MY* data is private. Thank you man!!! This is what i´m talking about my whole life.. YES, every word. I read somewhere that all new pc’s come with windows 10 by default.Does it mean, that it’s build-in and cannot be “deleted” in order to use linux instead? No. You should be able if, let’s say you buy a laptop that has Windows 10, to format the drive and install Windows 7 or Linux Mint, or your preferred OS. You have to watch out when upgrading a newly bought Windows 10 PC to Linux as Microsoft changed the requirements to gain the “certified for Windows 10” label from Windows 8, for Windows 10 they changed the option in the BIOS to disable secure boot from mandatory to optional so you would either need a version of Linux that supports Secure Boot or the OEM would need to include the option in the BIOS to disable it. That’s what Skylake is for mwahahahaha!! Should also note that changing your OS does often void many warranties offered by companies, as stupid as it sounds. Just FYI, I have Ubuntu 14.04 running on a skylake just fine. Your real privacy issues (not the anonymous aggregated telemetry done by Microsoft and Apple) still exist under Linux. The advertising infrastructure of websites and trackers will continue, even if you block ads with an ad-blocker. Information you freely provide is matched to you, not your computer, and is sold to others in thousands of available lists (for a price) to personally identify you, and the things you look at, buy, sell, like, dislike, etc. Windows 10 isn’t the culprit. The internet, and the convenience it brings, is. @Loss of Freedom, There’s no doubting you’ll still be tracked by certain websites but most of those are doing just that, tracking what sites you visit, maybe what you buy, or what you search for, but these are single companies and the scope of their tracking is limited, the same can’t be said of an operating system that has the capability to track everything from what sites you visit all the way up to what files are on your PC, what you’re typing, who your contacts are, and even where you live. I use NUC and avoid laptops. Yes, this is worrying, to say the least. But it’s more or less what was to be expected. I wish some techie would do the very same “idle connections” test with a Linux system too, so we could compare the Linux and the Win10 results. Perhaps this might also help a little in separating “innocent” connections from the “suspect” ones. (1) I’ve set GPedit to block Windows 10 installation through Windows Update, and I’ve blocked (hidden) all Windows updates related to upgrading to Win10, such as the notoriously re-appearing KB3112336 relating to “Windows 10 upgrade scenarios”. But of course Microsoft keeps trying. Two days ago and sneaking in outside the regular monthly updates batch, suddenly a new one (one that I hadn’t seen before) appeared in my Windows Updates list: KB3123862, bringing “Updated capabilities to upgrade Windows 8.1 and Windows 7”. If like me you hadn’t put this one on your block list yet, then look out for it! (2) I’ve set my system (through GPedit) to absolutely never use Microsoft’s OneDrive cloud service. I’ve also deleted the OneDrive data folder. But unlike in Windows 7, in Windows 8.1 it is not possible to simply uninstall the OneDrive software. Today, my firewall notified me that the OneDrive program had updated itself (an update I never asked for, of course) and was already connecting to Microsoft online. I’ve now deleted the complete program folder with the OneDrive executable (Microsoft stuck it under Appdata in the main User folder, not under Program Files where programs ought to be). So now I’m curious to see if and how this little bugger will re-install itself again! never delete the folder and think that the problem is gone for ever. Beter is to delete the content and deny “system” & “trusted installer” access to it. in that way MSFT can’t re install it. Make it read only as well. Even MS can’t change that. Windows 10, itself, is actually great…..The data collection that Microsoft is trying to upgrade all of it’s OS’s to have is what is preventing me from upgrading to it (at least, until I finish building/setting up my custom router to block such privacy collection). Of course, according to Microsoft, you have the freedom of opting out of any telemetry settings at any time….Tho when you directly question them about it, they give you a standardized statement that doesn’t even cover what you asked but sounds great! OF COURSE Win 10 is wonderful. And just as I suspected, a new user with an unknown name shows up (below) calling those of us with concerns “tin foil hat” wearers and “paranoid”. It never fails. Why install the OS ?? What a dumb question. It is installed on just about every PC/Laptop which is sold. I know that you could suggest installing one of the Linux flavours. Many people just want to access email, Facebook, etc, and browse the Internet. They do NOT want to go through the learning curve of using Linux, and it is a pretty steep learning curve for the average user. Well feel free to do your own traffic analysis and provide an alternate theory, until then, as with most theories, we’ll use the best currently available information, that’s how scientific theories works BTW. Yes other OS’s make random attempts, but AFAIK Windows 10 is the first desktop OS to make so many to different IP addresses mostly belonging to the developer of the OS, and on such a scale. Lastly you seem to have misunderstood how the person testing this actually tested it, any hardcoded IP addresses would’ve been logged as it was routing ALL the Windows 10 traffic via an external device, and lastly test were also carried out with OneDrive, Cortana and others disabled or removed using DisableWinTracking, as you would’ve read if you read the entire article instead of just jumping to Microsoft’s defense. Not fully true, there exist alternatives + some coming without OS or just format/reinstall the OS. I agree with you but there exist even live CD’s/DVD’s or hardened OS like Tails and and and. The benefit is that you can but not must install it which wipes then all data after shutdown more security is not possible. The distros are normally made for noobs and you not need much to know even if it’s linux, just install or start from cd/DVD/usb and browse the web secured by default. In fact every OS communicates to search for updates, MS (several years ago) was blamed because they not ‘listening’ to people and now they did and it’s called telemetry/spying without any proof which data really are send to them and how many. There are only people which trying to hype the story by playing with fears of other newbie users to say Linux is better, even if it’s not. As I said every OS want’s to communicate that isn’t the problem but it should be an opt-in/opt-out I agree but since Windows is improving a lot we may get an fully opt-out soon, it’s a learning thing we talking about. Which is Why people should run Destroy Windows Spying, which works in Win 7 and 8.1 as well as 10. It sets up the HOSTS to block all the outbound MS telemetry calls, among other great privacy fixes. I don’t know enough to swear to this, but I’m sure I’ve read somewhere that Win10 bypasses the hosts file to phone home. There were around 17 domain names listed in it when it was first discovered that Microsoft were doing this, maybe they’ve added more since the days of XP though. @Wayfarer, I wasn’t as clear as I should have been. I primarily meant that Win 7 and 8.1 users should be running it. DWS is called “Destroy Windows 10 Spying” which isn’t the best name for it, because it does a huge amount of good in Win 7 and 8.1 as well. I was really just saying 7 and 8.1 users should run it to block as much as possible in hosts and firewall settings. Many think that DWS is *only* meant to be used in Win 10 but it isn’t. does anyone know if there is a list like this for android? IOS? I would like to block all of this. If you want to block all of this when using a smart phone you’re out of luck, personally I’d never buy a smart phone as they’re renowned for taking a highly permissive stance when it comes to privacy and tracking their customers. Sadly it looks like Microsoft have gone down the same road with desktop devices, at least there’s an alternative to Microsoft and Apples Eye of Sauron on the desktop. You should stick a permanent post about this never-ending issue; and update it constantly ‘course. There are lots of huge IP blocklists out there for P2P, ads, countries, etc. I don’t really need any of those. I’m looking for a blocklist specifically for chatty devices and operating systems phoning home? Something that blocks Google, Apple, Samsung, LG, Microsoft, Sony, and so on specifically. Would love to see a comprehensive write up and analysis on all these companies, it would be very useful. My Lumia 435 has consistently declined to upgrade to Win10 – I’m not sure it’s even capable of supporting it. I was a bit disappointed until I read this – perhaps not so much now. I decided to look into the next IP on Martins top 10 (65.55.44.108), it’s Microsoft’s DNS server apparently and at first i thought that’s innocent enough and then it occurred to me, why is Windows 10 trying to connect to Microsoft’s DNS server? Did the guy carrying out these test not have a DHCP server and Windows 10 didn’t know what DNS server to use? That seems rather unlikely and even if it couldn’t find a DNS server shouldn’t any DNS requests just fail? Or is Microsoft performing a DNS poisoning attack and bypassing network settings, shouldn’t a network or machine only ever use the DNS servers its been configured with, why would Microsoft even need a public facing DNS server? I can now confirm that at least msnbot**.search.msn.com IP addresses are hardcoded. I block *.search.msn.com on my router/firewall (should point to 0.0.0.0), yet I’ve noticed in tcpview list that explorer.exe was connecting to several msnbot*.search.msn.com addresses (if I tried resolving them in command prompt window, they would show 0.0.0.0). I block explorer.exe with Comodo for now. That is, until Microsoft decides to speak up and break with vague terms when it comes to privacy and security, and gives a sufficient explanation as to which processes connect to which hosts, how often, and why. Now may be an opportune time for some articles regarding firewall distros, firewall programs, routers, DD-WRT, Tomato Firmware, building your own router/firewall, etc. More FUD being spread by Tin-Foil hat wearers who don’t know any better. It’s just telemetry data, whoopee. If you’re *that* concerned about ‘privacy’, you better sure as hell stop using anything made by Google, and Apple too for that matter…hell, just get off the Internet altogether if you’re that paranoid. If there’s Fear, Uncertainty & Doubt then whose to blame for that? People like Jackson honestly makes me feel sick when they claim people who are trying to investigate something are Tin-Foil hat wearers and spreading FUD, if people were trying to investigate corrupt politicians, child molesters, or tax fraudsters would you also say that it was FUD being spread by Tin-Foil hat wearers? Why exactly are people like Jackson trying to dissuade and ridicule anyone from investigating and learning about what’s happening, would you prefer we all lived in ignorance Jackson? I do NOT want my computer’s operating system sending out so called “telemetry” data. I do not have to explain why, or justify that wish to you, or Microsoft. It’s my computer. It’s my network. And I simply do not want telemetry data transmitting against my wishes. If your reaction to that is to be flippant dismissive, and resort to a grade-3 style ad hominem argumentative nature (name-calling, as in “tin foil hat”), well then I guess that’s just the kind of person you are. I don’t think I would like talking with you, or being around someone like you in real life. But whatever your own personality flaws are, as for mine, I repeat: I do NOT want my computer sending out telemetry data. Like I said, it’s my computer. Not yours. Not Microsoft’s. One can only hope that Microsoft gets that message soon through their thick pigheaded corporate skulls. Anyone remember what I wrote last Win 10 post, about how there’s always some guy comes along pimping MS and painting people concerned about their privacy as “tin foil hat” wearing lunatics. Just as regular as clockwork. These shills can go F themselves. How’s the weather in Redmond ? Did you enjoy your strategy meeting with Nadella the day before yesterday ? Did you get a bonus for using “Tin-Foil hat wearers” in your post ? I bet that Steve Ballmer was happy with your Win10 support. It must have pushed his MS shares value up above the last reported value of $ 21 billion. What a golden parachute for a failed CEO ! Did he give you a nice tip ? * learn how to safeguard your personal info. It’s nice that he went to the trouble of capturing network connections, however without decrypting the actual encrypted traffic and viewing what was actually being sent, it’s meaningless. The fact that the PC is making outbound connections alone doesn’t this tell us anything and is no indication of anything nefarious. He needs to look to see exactly what was sent/received over those connections in order to prove otherwise. Don’t get me wrong, I’m no fan of Microsoft following Apple and Google’s lead with Windows 10, but there needs to be more evidence of wrong doing other than the PC just making outbound connections. Not disagreeing with you Tim but isn’t this better than what we had previously, that being pretty much nothing. Yes it would be nice to do a packet analysis but there’s still a great deal of information that can be gleaned from just knowing what it’s connecting too, such as how Windows 10 makes regular connection to Microsoft’s DNS and Teredo Tunneling servers and why would Windows 10 be (presumably) bypassing the networks already configured DNS server in favor of its own, and why are Microsoft running a Teredo Tunneling server. A thing to test is to capture the traffic using Wireshark, so that some of the DNS lookups could be captured. Anything not encrypted, such as DNS lookups and port 80 (normal HTTP), should show some interesting data. Probably spying on you as you use the service. Windows 7 doesn’t talk to Microsoft once CEIP (aka:telemetry) has been opted out of, the only exception is when it contacts a NTP server to check the time, something that can also be disabled or configured to connect to any NTP server you want, WinXP is the same. Linux Mint doesn’t (afaik) doesn’t contact anything or anyone when sitting idle. Can’t speak for Ubuntu as i wouldn’t personally use it. This may not always be true. Late one night back in April of last year, I discovered something chewing on my hard disk. Turns out it was CEIP, and guess what? It was disabled. This could be an anomaly like Windows 10 installing on some systems without users consent. That’s F-ed up. Wonder how will be the situation after applying some of the more comprehensive privacy tools out there. i really appreciate your responses to my question far behing this post. copy and paste once again. also: great with all these comments and debate in general. they provide knowledge. Several months ago: https://tweakhound.com/2015/09/29/looking-at-windows-10-privacy/ They ran Wireshark also. “Local login. All privacy options turned off. I rarely use IE or Edge (and did not before or during this capture). I do not nor has this machine ever used the Microsoft Store. All uninstallable Metro/Windows apps have been uninstalled. Cortana is disabled. Windows 10 only made one connection yes but that was after the guy blocked what seems to be around 50 domain names (I’m not going to count them all) Is that really what people need to do to get Windows 10 to shut the hell up, how many normal users are even going to be aware of all of those domain names, let alone capable of configuring their system to block them. If you really want to see how much and the type of connections a virgin install of Windows 10 makes then the following link goes into more details. JasonA, thanks for the linkage (there is no “they”, just me). The list you seem to be referring to are the domains I was monitoring. In other words, they were the domains I was watching. In Wireshark you do that via a filter list. If you Google it you will find several for Win10. I combined 2. How do you find all these great reference sites ! @Eric (a.k.a. TweakHound), Nice to see you Eric. Have i misunderstood what you mean by filter list, by the sound of it i may have. As I’m not knowledgeable in the workings of Wireshark and having you saying you didn’t block anything is it safe to assume the the “filter list” is a list of what Wireshark looks for? If so apologies for the misunderstanding. Although if I’ve misunderstood and you only looked for connections to the domain names you listed for an hour that kind of, like a lot of other analysis of Windows 10, has a lot of omissions and caveats. This was well known fact but good that you pointed that out again. Didn’t microsoft claim late last year, that new patches to Windows 10 removed all privacy invasive features, as well as telemetry collection/sendoff? Never trust the opinion of someone when they make their living from the product or company that their speaking about, it is after all nothing more than Mr Bott’s opinion on what he “thinks” the data gathered from the analysis means, he provides no facts or analysis of his own to backup his assumptions. Mr Bott’s opinion is very biased as he directly benefits from promoting Microsoft products. As long as you’re pally with the American government everything should be fine, maybe, hopefully, fingers crossed. Yes, Micro Soft has indeed put spy ware on Win 7 via updates. Am using a software from Spybot Search & Destroy yo block but need to check results, Thanks for posting the IPs to block. So it seems after receiving a public castigation from the likes of Mr Bott the user who posted the connection log of Windows 10 has deleted the original post, it’s rather shameful that pressure from certain branches of the media have subjugated this sort of open discussion. I guess the likes of Mr please buy my Microsoft books Bott have managed to silence any criticism of his paymasters. So it looks like this recent furore has prompted a reaction from Microsoft, out caricature they’ve issued a statement, of sorts. Contacting me again a Microsoft spokesperson explained the company now wanted to speak about the issue. In short: Microsoft is taking action. It has decided to release updates “later this year” which will enable users to fully control all background telemetry and data tracking and, if desired, disable it completely. Microsoft also asked me to stress that disabling these background operations is something it would “strongly recommend against”. Yet again poor Ed Bott has to expose rubbish like this as the FUD clickbait it actually is. Sad part is, people fall for it. TBH Jackson I’m more inclined to believe Mr Kelly than anything Mr Bott says, Mr Bott seems to take any criticism of Microsoft or Windows extremely personal and ends up resorting to ad hominem attacks on people, I’m not going to call it on whose right though as it’s probably best to take a wait and see approach. Read my response to your last post (Feb 10th). Poor Ed Bott ?? He is the highest paid MS shill ever. Didn’t microsoft claim late last year , that new patches to Windows 10 removed all privacy invasive features, as well as telemetry collection/sendoff? This will continue to blow up, and become main headlines on slashdot, and threatpost. How do I know if I need msnbot-65-52-108-92.search.msn.com ?